View More In Computer Components. The Pyramid Power Supply provides convenient and reliable AC-to-DC power performance. Universal hardwired screw-type connection terminals are hassle-free and ensure compatibility with a wide range of device equipment & components. Simple electronic plug-in operation provides a constant source of DC voltage, allowing for quick and consistent power conversion. Switch-activated power control eliminates the need of an external battery or an additional power source -- while the built-in electronic overload and short-circuit protection ensure safety of the operator & any connected electrical devices. 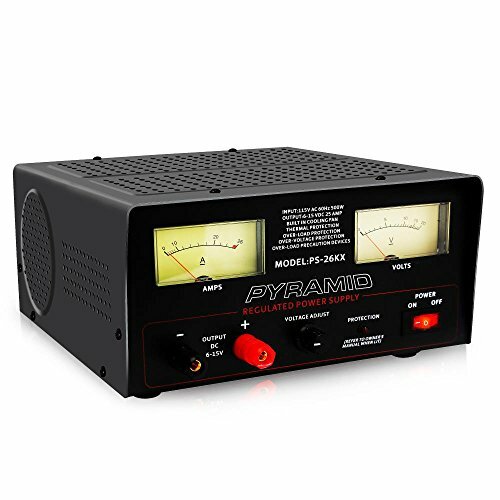 The Pyramid Bench Power Supply makes for a great addition to any hobbyist work desk or equipment testing station.